Robert Rainey was his Instructor. He had Basic at Macon, GA and graduated from Moody Fld, GA. S/N: O-838852. He became a B-29 Pilot. He was discharged on Dec. 6, 1945. Then he went to college and in 1950 he became a Flight Test Engineer at Wright Patterson A.F.B 2nd Lt.
From his obituary [The Buffalo News]: “an Air Force Lieutenant during WWII”. He graduated as a bombardier with the Class of 45-06 at San Angelo AAFd in Texas on March 29, 1945. Kenneth graduated from Spence Field, GA. S/N: O-838385. He started out flying fighters and then was checked out on B-29 ‘s. His service was all in the U.S.A. 1st Lt. He graduated from Turner Field, GA. S/N: O-836633. He served during WWII and was recalled in 1951 during the Korean War. 2nd Lt.
SN: O-838314. He served with the 40th Bomb Group 44th Bomb Squadron (VHB). He graduated from Blytheville, AR. F.O. S/N:T-65507. He served in India, Flying the “Hump” in B-24’s. He stayed in the Reserves until 1972 when he retired as a full Colonel. Enlisted April 08, 1942 in New York. Student Officer: 1st Lt.
Franklin Pierce was his instructor. He had Basic at Cochran, GA and graduated from Spence Field, GA. S/N: T-66558. He ended up in B-29’s. Flight Officer then 2nd Lt. He graduated as a bombardier with the Class of 45-06 at San Angelo AAFd in Texas on March 29, 1945 S/N: O-2087028. Died: August 12, 2009 Springfield, MA. James graduated from Spence Field, GA. S/N: O-838400. He served in the Pacific and was in Japan. His instructor at Douglas was Ferrell? (Probably Charles Sherrill.) He graduated from Blytheville, AR. S/N: T-66508. 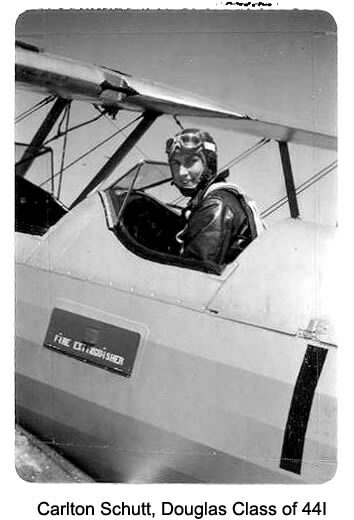 He served in the Air Transport Command, flying mainly between the U.S. and England, supplying the 8th A.F. Died Nov. 3, 2014, age 92. Later of of Morrisville, PA.
S/N: O-838872. He was a Major in the USAF in 1968. Later was LtCol. DOB: June 24, 1924. Enlisted: Jan 23, 1943 North Carolina. Basic at Cochran, Ga and Advanced at Spence Fld, GA., where he was one of the 60% that washed out. He then went to mechanics school and was assigned to India, Burma and China. He graduated from Blytheville, AR. S/N: O-838319. He served in WWII in the Pacific and was in Tokyo, Japan. He was also in the Korean war. 1st Lt. He graduated from Moody Field, GA. S/N: T-66851. He served in the Air transport Command flying cargo planes. Lieut. John Sineath was his instructor at Douglas. 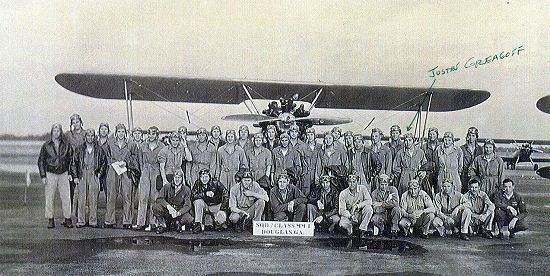 Click here for a picture of him in his squadron at Douglas. He graduated from Blytheville, AR. F.O. S/N: T-66516. He flew B-24’s and served in the Pacific with the 380th Bomb Group in the Philippines. Enlisted from Washburn, WI on 09-30-1940. Student Officer: 2nd Lt. SN: O-863631. S/N: O-838415. 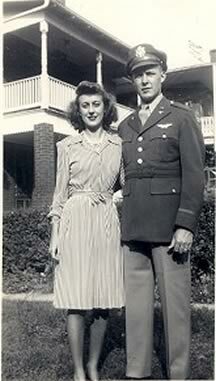 He was a Second Lieutenant in the USAAF reserves in 1947. Born February 23, 1923 in Chicago, Il. Krusicki / Krasicki?, Richard I. He received his wings at Blytheville, AR. He went into B-24’s and then B-29’ s. Before he was ready to go over seas, the Bomb was dropped and he was soon released. 2nd Lt.
Stephen Bassford was his instructor at Douglas. He graduated from Blytheville, AR. S/N: O-838335. He went into B-24’s and then B-29’s. Before he was ready to go over seas, the Bomb was dropped and he was soon released. 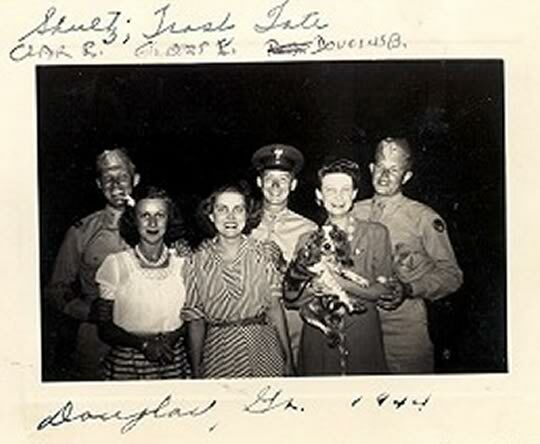 2nd Lt.
Enlisted 06-17-1941. Student Officer: 1st Lt.
Ken Landis was his instructor at Douglas. He served in the Pacific area flying B-29’s. 1st Lt. He graduated from Moody Field, S/N: O-838336. He was assigned to Laredo, TX. A.F.B. 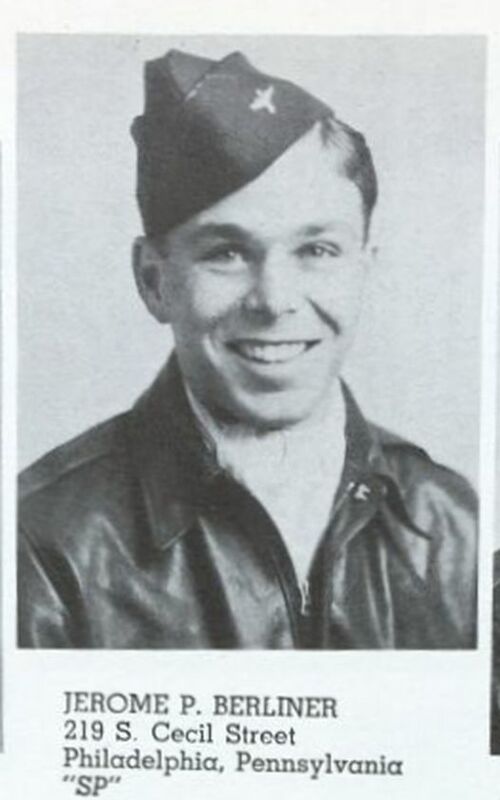 He was killed flying as co-pilot in a B-24 accident near March Field, Cal. May 4, 1945. 2nd Lt. He graduated from Moody Field, GA as P.O. He flew B-29’s in the U.S.A. The war was over before he was sent overseas. 2nd Lt. He graduated from Blytheville, AR. S/N: O-838337. Was assigned to Laredo, TX. 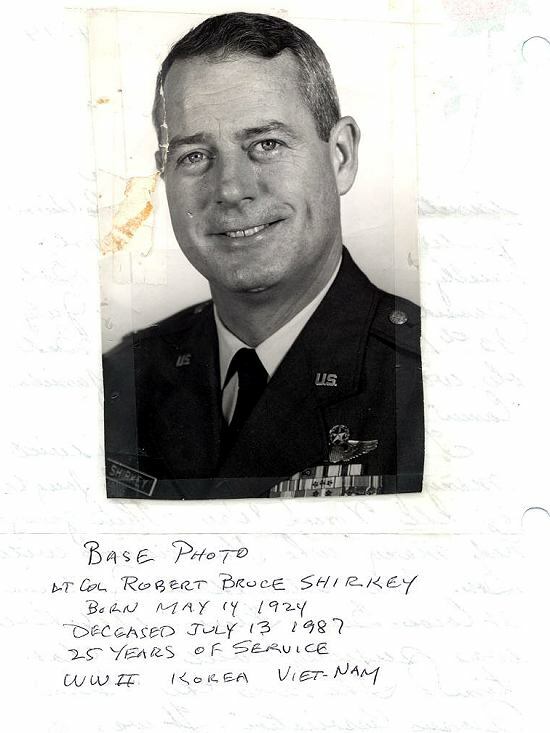 He stayed in the Air Force until retiring on Sept. 1, 1969. Lt. Col. He graduated from Columbus, MS. as a F.O. S/N: T-66719. He flew B-24’s in the 15th Air Force. He graduated from Blytheville, AR. S/N: O-838380. Was assigned to Laredo, TX. He graduated at Blytheville, AR. S/N: O-838340 and then assigned to Laredo, TX. Then assigned to the 360th Air Service, flying B-24s on Okinawa. The war ended and he spent the rest of the time making supply runs in a C-47. He was discharged at the end of the war, but stayed in the Reserves. He practiced Internal Medicine and was also a Senior Aviation Medical Examiner. He graduated with the Class of 44J S/N: T-067518. Then he went through Troop Carrier Command training at Blytheville, AR. John graduated from Blytheville, AR. S/N: O-838341. He went to the Pacific and was in Japan flying B-24’s. 1st Lt.
S/N: O-838927. He was flying a B-25J under the direction of the Air Transport Command / South Atlantic Division (1159th AAFBU) and was killed in a flying accident on Ascension Island on June 11, 1945. The airplane crashed into the sea shortly after takeoff and sank after a few seconds. He and 2 others were never found; three other crewmen survived (MACR #15403). S/N: T-66539. He was a Flight Officer serving as a B-24 copilot with the 492nd Bomb Group flying clandestine missions out of Harrington Aerodrome in England. He graduated as a bombardier with the Class of 45-15 at Big Spring AAFd in Texas in May 1945. Enlisted February 05, 1943in Des Moines, Iowa. Charles Hoeffler was his Instructor at Douglas. 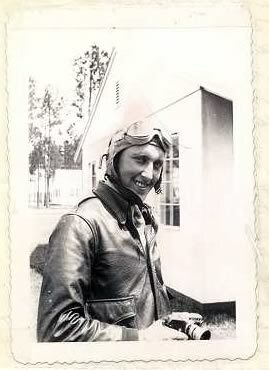 He had Basic at Macon, GA. Paul washed out at Advanced while flying P-40’s at Moody Field, GA. He went on to be commissioned as a Bombardier-Navigator on a B-29. He graduated as a bombardier with the Class of 45-14 at San Angelo AAFd in Texas on May 24, 1945. 2nd Lt.
Click for a listing of his service (PDF). Wilson Myers was his Instructor. 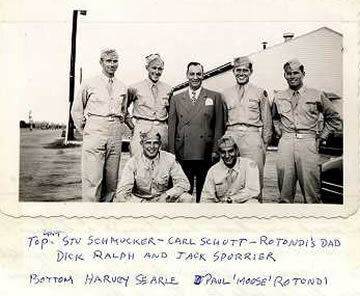 He was in Squadron 8 (see picture at top of page). He had Basic at Macon, GA and he graduated from Blytheville, AR and was assigned to Laredo, TX. He went into B-24’s. Later he was checked out in B-29’s at Maxwell Field. He was recalled for the Korean War. A long military career followed. He retired in Sept. 1973 as a Colonel. Click here for him in his plane. Harvey washed out in Advanced at Blytheville, AR. Then became a Navigator and Bombardier (S/N: O-2088813) Class of 45-13N. He bombed Japan with the Norden Bombsight. He was recalled and flew 63 missions in Korea. He continued with his military career and retired after 30 years on 1971. Lt. Col.
Robert graduated from Blytheville, AR. S/N: O-838353. He was a B-17 Pilot during W.W.II. He made a 25 year career of the Air Force. Lt. Col. He graduated from Blytheville, AR. S/N: O-838354. He became a Co-Pilot on B-24’s. They put a crew together and went to Westover, MA. ready to go to Europe. The war was then finished in Europe, so the went toward the west coast to go to the Pacific. The bomb was dropped and that cancelled the Pacific tour. Then he went to Korea as a C-47 Pilot flying 50 missions. 1st Lt.
Bert Hood was his Instructor. He graduated from Moody Field, GA and did all of his Service in the U.S.A. mainly in the S.E. part of the country. 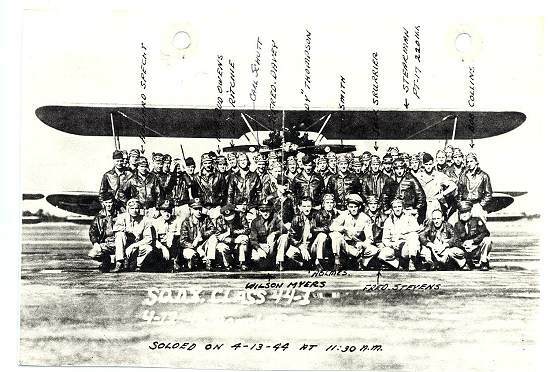 Became a gunner in the 455th Bomb Group on a B-24 (see http://www.15thaf.org/304th_BW/455th_BG/Newsletter). On Apr 25, 1945, on his 18th mission, his bomber took heavy flak over Linz, Austria and crash landed near the Adriatic Sea. Frank graduated from Spence Field, GA. S/N: T-66598. His service was all in the U.S.A. including delivering P-40’s to the “Bone Yard”. He graduated from Blytheville, AR. as a F.O. S/N: T-66545. He was in the 10th A.F. He flew B-24s in the C.B.I. Theatre. He was awarded the Asia Pacific Star, Air Medal, The Distinguished Unit Badge and the China War Memorial WWII Victory Medal. From his obituary [St. Petersburg Times (FL) – Sunday, June 6, 2010]: “He flew B-24’s in WWII”. He graduated from Moody Field, Ga with class 44K, and was assigned to stay at Moody to instruct there. Next to Dodge City, Kans. for B-26 training. Then to Pampa, TX. after which he was discharged. 2nd Lt. If this is the right obituary [Petoskey News-Review (MI) – Wednesday, January 14, 2009]: “Robert served in the United States Army Air Force during World War II”. Died Jan. 11, 2009, in Huntingdon, Pa.
Harley Pickett was his instructor at Douglas. He had Basic at Macon, GA and graduated at Blytheville, AR. S/N: O-838365. He was based at Mitchell Field flying B-24’ s. He was scheduled to go to Europe but became ill. He finally got to Europe in 1946 for a year. 1st Lt. He graduated from Columbus, MS. and served in the U.S.A. flying B-29’s. 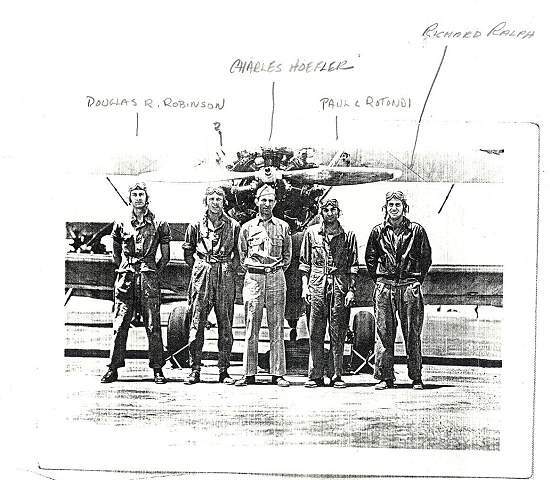 1st Lt.
Charles Hoeffler was his instructor at Douglas. He served in the Pacific Area. He flew 7 missions from I E Shima. Afterward he worked for Eastern Airlines for 12 years and 2 more for Alaska Airlines. 2nd Lt. Served WWII, Korea and Vietnam (see FindAGrave). Welton, Robert H. B. Jr. He graduated from Columbus AAFd, MS (S/N: O-838714) and was then assigned to Morris Field for transition training into attack bombers. He graduated from Blytheville, AR as F.O. S/N: T-66550. “Served as a pilot” per FindAGrave. 1st Lt.
Born Dec. 9, 1923 in Virginia.